Car Inspection And Why Is It Necessary? If you own a car, then used car inspection is one of the main things that should be kept in mind. Paying a good attention to your car’s overall health is necessary and this keeps you away from most of the problems related to your car. Also, safety plays the most important role when it comes to owing or driving a car. Keeping a periodic check on all the parts of your car and repairing and maintaining them time to time helps you keep yourself and your car safe. Car inspection should be carried out by a professional mechanic who will understand in and out of a car. However, sometimes it can be a hassle to find a suitable mechanic, and then taking your car to that person on a particular time becomes even harder. This is where ECO by Droom, India’s first and only marketplace for automobiles and vehicle related services, comes in. ECO offers car inspection services at a very reasonable cost. Furthermore, you can order the services on your doorstep and also you can mention the suitable time. At ECO, we provide a complete used vehicle inspection solution to our customers. The used car inspection done by our mechanics includes everything related to a car’s check-up. 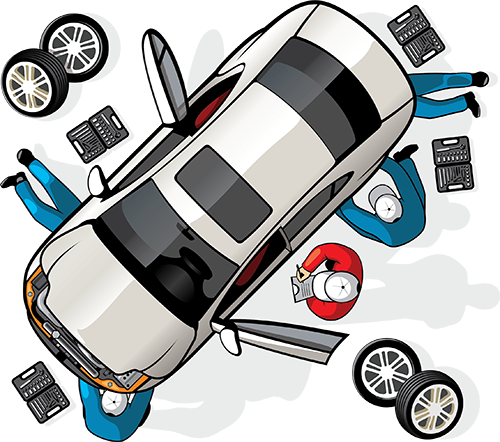 It includes a detailed analysis of various parts of your car such as body of the vehicle, paint, damage caused by accident, rust, etc. Also, at the time of buying a used car, you should use this service, as you never know what is hiding behind the shining outer appearance of the second-hand car you are going to buy. ECO helps you get all the necessary information regarding a used car’s health. Used car inspections done by ECO are carried out by experienced technicians at the best price possible. ECO by Droom provides the best car inspection services that you can rely on. Always remember that checking all the parts of your car after a certain period of time helps you keep its value high in the market.